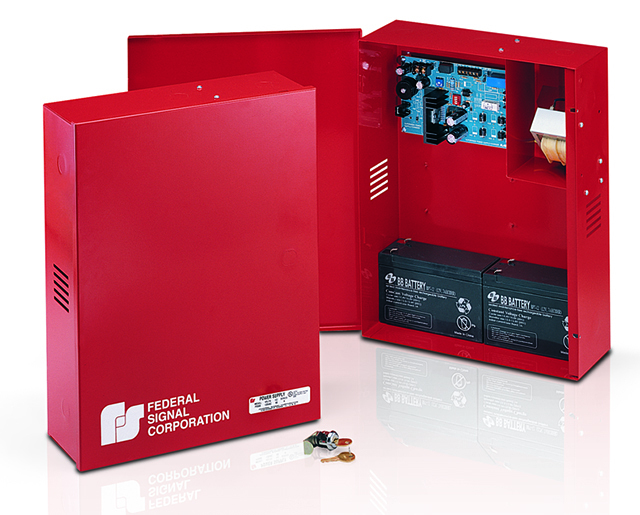 Federal Signal Power Supplies provide nominal 12VDC or 24VDC power that is switch selectable. The PS250, PS600 and PS1000 are designed for use as standby battery back-up during a power outage. The steel enclosure is designed to mount on a wall or substantial vertical surface (indoor only). A key lock is provided to discourage unauthorized access – simple lock installation is required. The power supply sub-assembly, which recharges the batteries, includes solid-state circuitry that provides DC operating voltage to units in a SelecTone® system, while maintaining a charge level on the batteries. All of the units can also be used as a primary 12V or 24V power source for other devices/systems. Model PS250 – Designed to use two 7 amp-hr, sealed lead-acid, gelled electrolyte batteries connected in series – is rated for 2.5 ampere, and is UL listed. Model PS600 – Designed to use two 12 amp-hr, sealed lead-acid, gelled electrolyte batteries connected in series – is rated for 6 ampere, and is UL listed. Model PS1000 –Designed to use two 12 amp-hr, sealed lead-acid, gelled electrolyte batteries connected in series – is rated for 10 ampere, and is UL listed. Model PS1000-240 – Designed to use two 12 amp-hr, lead-acid, gelled electrolyte batteries connected in series - is rated for 10 ampere.